In January, Claire Sonnet, the new restaurant manager at Louis XV – Alain Ducasse à l’Hôtel de Paris, was named ambassador of “Prominent Women”, a programme launched by organisation Les Grandes Tables Du Monde. But let’s take a closer look at her – exceptional – career and her – greatly human – approach. She has become restaurant manager of one of the most prestigious venues in the world. Yet, nothing could have fated Claire Sonnet for the universe of high-end gastronomy. It was during her studies in psychology that she stumbled upon hospitality, with a student job that would prove a founding experience. It was there that she met Monsieur Angelo, a maître d’hôtel, both conductor and player in a trade geared towards others, who would pass on his skills to her and, most importantly, his passion for hospitality. With her psychology bachelor in hand, she attended École Grégoire Ferrandi, a prestigious culinary school in Paris, before working at the most esteemed French addresses. From the restaurant Alain Ducasse at Plaza Athénée alongside Denis Courtiade, to the reopening of the Hôtel de Crillon in 2017, where she became restaurant manager for the first time, Claire Sonnet has strived to keep learning and pass on her passion for hospitality. A conversation. According to you, what are the necessary qualities to blossom and rise through the ranks in hospitality today? Above all, it’s no secret, you need to love people, you must strive to welcome and share. 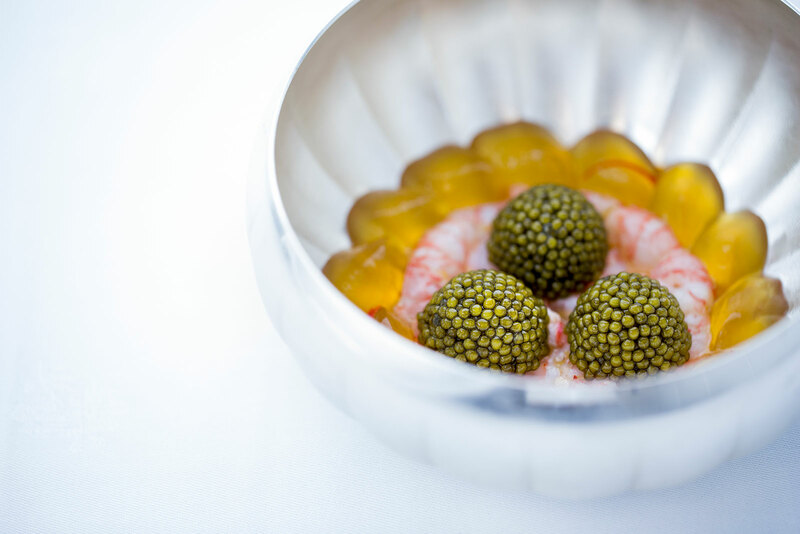 Humility is also a very important trait, it’s something that really struck me when I was working at retaurant Alain Ducasse at Plaza Athénée: when the doors open, ranks move aside and we’re all working for the client. Another essential part of course is transmission, between the chef and clients first of all, for which we are the messengers, but also between all employees. The restaurant staff must come together as one: we often describe ourselves as a chain. Each link is important and plays a part; we must pass on our passion. And this transmission can’t be accomplished without empathy, without understanding the expectations of the people we face. 2002-2005 : Student job during her psychology studies in a luxury brasserie and encounter with Monsieur Angelo. 2008-2011 : Discovery of new practices and another approach to French gastronomy living in United Kingdom and Spain. 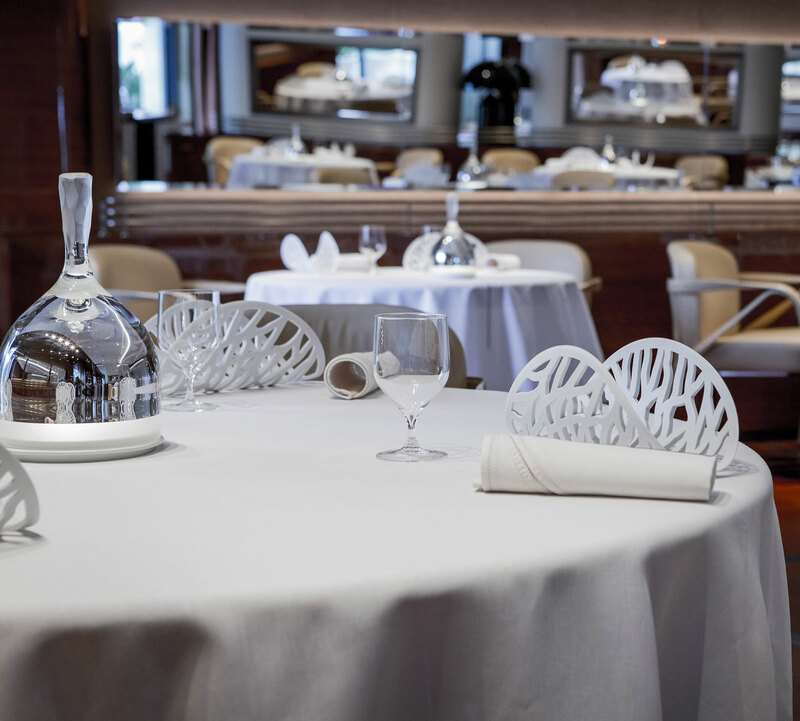 2011-2017 : Restaurant Alain Ducasse au Plaza Athénée: internship, encounter with Denis Courtiade, and discovery of the world of high-end gastronomy. May 9th 2017-December 5th 2018 : Restaurant manager at L’Écrin de l’Hôtel de Crillon, led by chef Christopher Hache. Since decembre 17, 2018, she moved to Monaco and joined restaurant Le Louis XV – Alain Ducasse à l’Hôtel de Paris. You are in charge of promoting the role of women for organisation Ô Service – des Talents de demain; could you give us an outline of this programme? The organisation aims first and foremost to promote hospitality jobs, as this is the very sector that moves and captivates us. Through various initiatives, such as meetings, seminars, competitions, etc. we strive to share this passion so generously passed on to us by women and men alike. Regarding the promotion of women’s roles in particular, we try to keep in touch with one another, not necessarily as a “girl gang”, but simply to show that women are present and active. For instance, we’re working with Elsa Jeanvoine (winner of the 1st Maître d’Hôtel Award) on several actions: contributions to competitions, involvement in juries, but also opening the doors of our establishments and giving access to exceptional environments to some young people who wouldn’t instinctively gravitate towards them, either out of shyness or because they wouldn’t dare. It is our role to show them that with enough passion and drive, these environments can become accessible. Throughout your career, have you had the opportunity to collaborate a lot with women? I’ve witnessed a genuine evolution between my first internships, the moment I went abroad, and when I came back. At that time, mentalities started to evolve and since then, we’ve grown more and more numerous. It is in fact a tremendous asset because I believe everyone, men and women, have a role to play in our trades. Of course, as of today, there are still more men on the market, we receive more CVs from men, but that’s the way today’s society is, so this further highlights the importance of women’s promotion programmes. Do you think the increased presence of women in the catering industry in the last few years has had a positive influence on gastronomy? We are in a Man’s world, with capital M. The human aspect matters above all else. So yes, it is extremely important and beneficial for women to grow increasingly present in these trades and within our teams, and this is something we of course have to promote, but above all we must promote talents. Jessica Préalpato and I agree on the matter: we do not want any preferential treatment because we are women; we want to succeed and earn respect in our own right, through our work and the values we live by. which is why I wouldn’t necessarily aim for a perfect balance either. We need a little of everything, different identities, personalities, because we’re always facing different people. Our role is to harmonise, to have a good feel with the client, and say “yes this will work with this specific person”. You mentioned benevolence, humanity and transmission as the cornerstones of your trade. Do you believe these values contribute to more equality in the catering industry? Or do you think it is still necessary sometimes to elbow your way through the field? Of course it is sometimes necessary to elbow your way through and know how to gain a foothold, but everything is a question of respect, transparency and honesty. I remember a conversation with Denis Courtiade during which he told me “you can be an excellent number two, and that’s your choice, or you can be number one. If you want to be number one, come, and if you don’t want to, it’s not worth it”. I also keep in mind another of his sayings: “the team is in the image of its manager. If the manager isn’t doing well, the team won’t either”. Every body need a human locomotive; you have to put them in the best possible conditions, to motivate them, because they are asked to do a lot. It can be difficult to convey all the values, all the messages, to give everything to a client we don’t know at all. Developing personalities, human connections is therefore absolutely essential. What should we do for a better tomorrow? A restaurant is all about a team, a single team at the client’s service. We come together as one, and each stakeholder must strive towards this goal. We must highlight all types of profiles and introduce a culture of equity in these trades, build up solidarity. This bond is our strength.